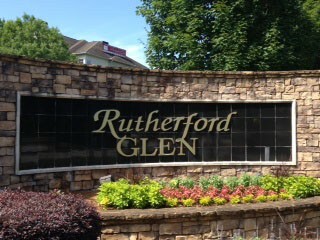 We are frequently asked to re-vamp and modernize existing entrance sign monuments. To save costs, we recycle as much of the existing structure as possible. Choice of font (typeface) is a great way to bring and outdated sign monument structure into the present. Color combinations and finishes can make a sign look like a million bucks. 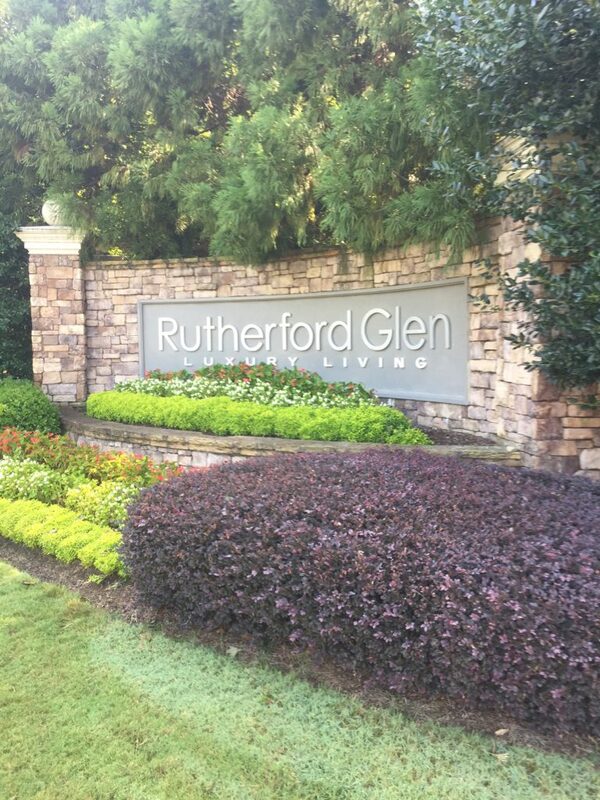 Thus example for Rutherford Glen replaced the black marble tiles with a stucco surface. We then pin-mounted 1″ thick letters finished in brushed aluminum enamel so that they floated above the curved surface 1/4″. This installation method creates a drop shadow behind each character, making the text visually ‘pop.’ The slight contrast between the stucco texture (flat finish) with the metallic silver (high gloss finish) truly reflects the high-end image for this luxury community. Original sign structures before revamping – entrance sign monuments. 1″ thick solid letters finished in brushed aluminum on a curved stucco wall in stacked stone. Custom entrance sign monuments. We welcome any challenge in custom entrance sign monuments, and can produce anything you can imagine! Please use our online contact form to start your next sign project. We look forward to working with you! This entry was posted in Apartment Complex Signs, Commercial Signs, Property Developer Signs, Residential Signs by BSM Staff. Bookmark the permalink.